CUNO's unrivaled filtration media development capabilities and advanced manufacturing processes enables the production of the CUNO Series NB polypropylene and polyester felt bag filters. Meeting the most demanding customer specifications, the Series NB bag filters are highly reliable with predictable and repeatable performance. The Series NB bag filters are designed for applications where 1 to 200 micron filtration at up to 180 gpm (#2 bag size) is required. 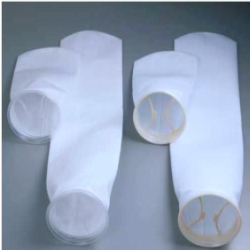 CUNO offers a line of Size #1 and #2 felt filter bags in grades ranging from 1 to 200 p.m in various collar/media configurations (see ordering guide) with the following important. Predictable Removal Efficiencies — Through controlled media specifications and advanced Mmnufacturing processes. Media Migration Control — Through thermal treatment of the exterior surface of the filter media and the use of state-of-the-art procedures to properly weld the media seams and the media to the collar. Proper Sealing — All CUNO felt filter bags come standard with a specially designed plastic collar for proper sealing of the Series NB bags in conventional bag housings. This design feature is important as improper sealing can result in fluid bypass and contamination of the downstream fluid. Utilizing the latest technology, the bag filter media is welded to the collar preventing problems associated with stitched collars. The collar includes a ergonomically designed handle to allow for easy removal of the bag filter. For ease of identification and traceability, the handles include an engraved tab providing micron grade and manufacturing lot information. CUNO's sales support teams are dedicated to working with you to identify the optimum liquid filter product for your application. With CUNO's complete line of filter product solutions, you can be sure that you are getting the best filter solution for your application. For new installations, CUNO offers a full line of bag filter housings, contact your local CUNO sales representative for more details.